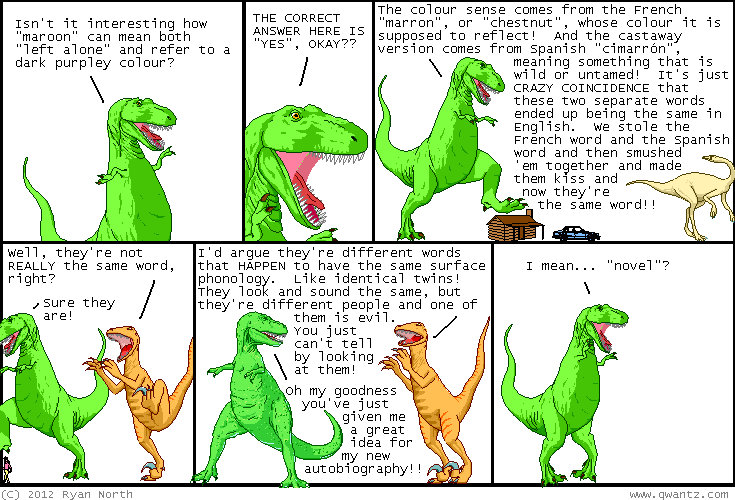 Dinosaur Comics - July 4th, 2012 - awesome fun times! July 4th, 2012: So this comic where T-Rex wanted to write his own computer game has already produced Press X To Eat A Big Pie, and yesterday Matthew emailed me T-Rex's Horse Game as a Text Adventure that you can play online! Most exciting is that you can look at the source and see how it's written, which is in Inform 7, a programming language that's not dissimilar from what T-Rex wants! One year ago today: if you chose seventeen between panels one and two, congratulations, but ask yourself this: why do you respond to "dromiceiomimus"?